Rode Monroe to Trumbull to Monroe to Newtown to Monroe on the rail trail this morning. I figured after all this rain I would give the trails a break. 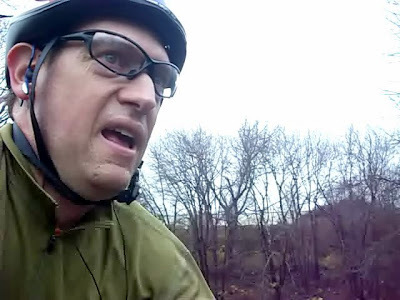 I did see quite a few people riding in the Pequonnock River Valley, though, but Trumbull, like Mianus, is one of those places that no matter the conditions people will ride there regardless. 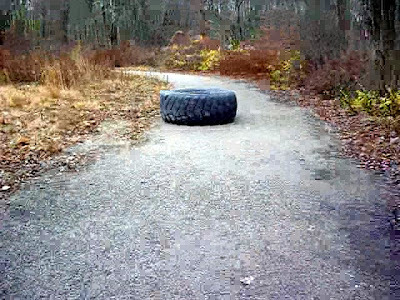 I guess some kids rolled this out into the trail. It was a little surprise but what was even more surprising is how I stopped to avoid it. I did my first skid patch. I was only able to do it becasue I was on gravel though. 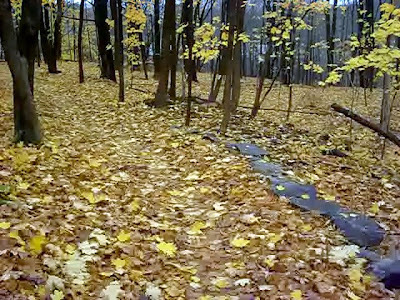 There is one section of the trail that is still single track. Kind of fun on a fixed gear especially when you can't see the rocks! The Monroe section was pretty quite but the Trumbull section was awash with joggers and walkers. I yelled at one couple because they didn't have a leash on their dog and I almost cut it in half as I swerved away from it. Another group of joggers were running four abreast and would make room for me to pass through them so I went around them on the shoulder, it was a little bumpy. Otherwise, it was good 20+ miles. The Stinson performed great! This bike is finally dialed in. The flared drops are the best. Too bad they are incompatible with the barcons that I got.